It seems like just yesterday when Tony Romo, beloved quarterback of the Dallas Cowboys, went down in the third week of the preseason. We all remember it. It hurt. Remember what we all thought? "He'll be back soon, meanwhile we'll win some games with this kid, Dak Prescott. And when Tony gets back, we'll just move on." Things sure were different though. Dak started winning. A lot. And when he won, the inevitable happened. The media and fans started talking. Out of nowhere there was a quarterback controversy in Dallas and just like that, the situation with Dak Prescott and Tony Romo became the story of the year. It seems unbelievable that all this began all the way back in September, 2016. We, as fans, were divided. Team Tony and Team Dak. Many of us, including Dak, were sure this was Tony’s team. Number 9 was the guy who would lead Dallas to the playoffs, and maybe even to Houston. But a time came when no one could deny it. The Dallas Cowboys had a new QB1. 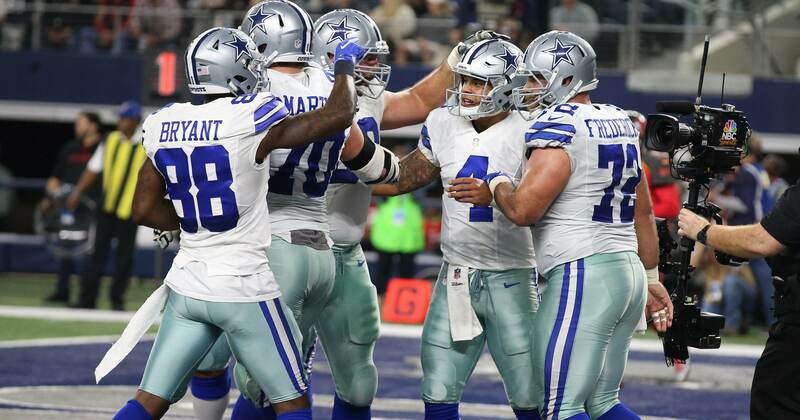 We know the story; Dak Prescott went 8-1 in the first 10 weeks of the season, including victories in an overtime win versus the Philadelphia Eagles and a shootout against Ben Roethlisberger and the Pittsburgh Steelers. Tony Romo gave an emotional press conference about how Dak, the rookie, had earned the right to be the starting quarterback. For a second, it seemed as if the media would finally stop talking about it and move on. Yes, the Cowboys lost in their first postseason game this year, adding an ugly loss to Dak Prescott's NFL career. But he threw for 302 yards (eighth most by a Cowboys QB in postseason, Tony Romo never surpassed that mark) and became the first rookie QB in NFL history to throw for three touchdowns in a postseason game. The last question mark Dak had to face before the season ended was answered. Even if it didn't end the way we all wanted, he played at a great level. He led the team back from an 18-point deficit to tie the game at 28 and then again at 31. He was calm, he was cool, he was himself. I'm a Tony Romo fan. I've always been a Tony Romo fan and I'll continue to be one wherever he ends up playing. He was the first quarterback I ever saw as a young Cowboys fan. I grew up watching him, defending him every Monday at school, and feeling empty when he went down injured. I'd be lying if I told you that up till week 9 this season, I was expecting Tony to return and be the starting QB for this team. But now, there's no doubt. Dak Prescott, the story of the 2016 NFL season, the surprise rookie, the new face and the new leader of the Dallas Cowboys, has begun another era for this franchise. For a large generation of young fans, he is only the second guy to come in at this position. Dak has been the guy since week eight, maybe even earlier. He led the team to 13 wins, the #1 seed, and was close to winning a shootout with Aaron Rodgers -- one of the league's best -- in the Divisional Round of the NFL Playoffs. Now that the season is over, it's a good time to reflect. It's time to recognize Dakota Prescott and trust him as the future of this great franchise. A new QB, a new face, a new era. How do you feel about Dak Prescott leading this team in years to come? Let us know in the comments below, or tweet me @PepoR99 and let’s talk football! If you like football and are looking for an NFL show in Spanish, don’t miss my weekly 4 Downs Podcast! Tell me what you think about "Moving On From Tony Romo, This Is Dak Prescott’s Era" in the comments below, or tweet me @MauNFL and let’s talk football! If you like football and are looking for a Dallas Cowboys show in Spanish, don’t miss my weekly Facebook Live! show, Primero Cowboys! 2017 NFL Draft: Could This Stud Defensive Linemen Fall To The Cowboys?